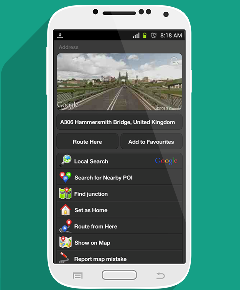 Although many of us use the common and popular GPS software like Google Maps or Waze, on our Android phones. The problem happens when traveling overseas and we do not want to use data services on roaming. We are also not interested in paying $15 a day to rent a GPS from the car rental company. That is just absurd! This summer, while traveling in Europe on vacation, I can across a free GPS, that does not require a data connection. The maps you need are downloaded onto your phone. Visit Google Play, and Download the NavFree GPS. Here is the link: https://play.google.com/store/apps/details?id=com.navfree.android.OSM.ALL. Now, in order for the GPS to work on your Android phone, you do NOT need data services. The only reason why Google Maps and Waze needs data service is because they are constantly updating and downloading the real time maps of your area. Once you install Nav Free GPS on your phone, you go into the app and choose which countries to download maps for. If you are traveling to France or England, you only download the map for that country. You will not have maps of the entire Europe. Now it works well, with the exception that I could not browse the map until I had arrived in Europe. When I opened the map, it showed my 5000 miles away in America! To make things easy, I looked up and added to the favorites, all the locations of sites we planned on visiting. This made things much easier once we got our rental car and we did not have internet access to start looking up the hotel address and the addresses of tourist sites. All in all, it was a great app, that saved us $15 a day, or $150 for our 10 day vacation!